In my world I would like to create a pit on the Moon filled with air. Could the pit maintain the air or would it be lost to space? If it would be lost, how long would it take? could a cap be enough to prevent any loss? Is the needed depth feasible on the moon? That's pretty simple - about 300 km deep. More or less. Depends on how long you expect to keep it. Atmospheric pressure is simply the weight of gas above the observer. On earth, 99% of the atmosphere is found below 32 km, and 99.9% below 50 km. On the moon, with a surface gravity of 1/6 that of earth, a similar column of gas would be 6 times longer or about 300 km. 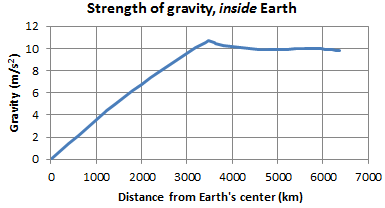 Since the radius of the moon is about 1700 km, the gravitational gradient down the pit would be about 1/3 - that is, the gravity at the bottom of the pit would be about 67% of the surface gravity. 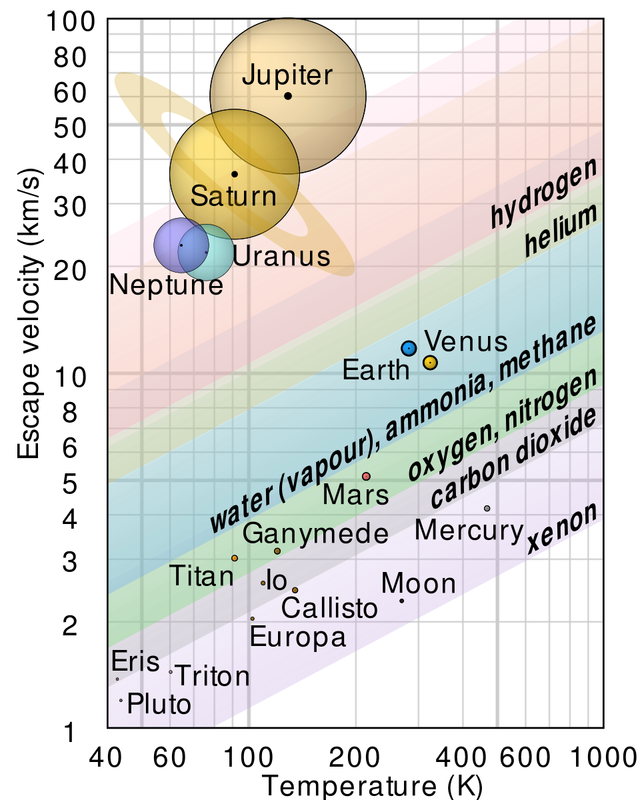 So the surface gas density would be something like that on earth at 33 km. Gone, gone, gone. The pressure of the earth's atmosphere at 33 km is about .017 psi. Unfortunately, it's surrounded by a much better vacuum, and will dissipate at some speed, causing more air to rise and disappear. Sorry, but that's beyond me. Weeks to years, I'd guess. Sure. The total pressure difference is pretty small, so for a small-diameter pit a cap seems perfectly reasonable. If you're talking miles wide to support a colony - not so much. Nope. With about 1/6 the gravity, this more or less equivalent to a hole 50 km deep on earth. At these depths rock will deform like toothpaste under the weight of the overlying burden. Well, slow toothpaste. Pressure is about 17,000 atmospheres or 260,000 psi. That's pressure in the rock, not the atmosphere. The other answers are wrong due to some oversight. Oxygen will stay on the Moon as a gas, as long as it doesn't get neither too hot or too cold. Close to 50K it will liquify; close to 60K it will escape the hole and the Moon. there are places that remain in permanent shadow at the bottoms of many polar craters, and these "craters of eternal darkness" are extremely cold: Lunar Reconnaissance Orbiter measured the lowest summer temperatures in craters at the southern pole at 35 K (−238 °C; −397 °F) and just 26 K (−247 °C; −413 °F) close to the winter solstice in north polar Hermite Crater. So you dont need to dig a hole, some already exist. Just flush the gas in and keep an ideal temperature. Yes, it is possible. Consider that at the bottom of a valley one is closer to the center of mass of the planet, thus gravity can be relatively stronger, and this could reflect on the local atmospheric pressure. On Earth we don't have valleys deep enough to experience dramatic difference, but we have such feature on Mars: Valles Marineris. Up to 7 km deep, the pressure at its bottom is about 0.168 psi, while the average atmospheric pressure on Mars is 0.087 psi. About double, as you see. Still not high enough to take a walk in T-shirt, but if the atmosphere on Mars would be more dense, it would be first spot to achieve habitable conditions. The main difference with the present question is that the Moon gravity is way lower than the one on Mars, and even at "ground" level there is no appreciable atmosphere, while there is on Mars. So, while on Mars the surface pressure is about 600 Pa, on the Moon it is 0.3 nPa. Therefore, even digging a very deep hole or trench, and assuming a similar behavior of the gravity vs depth on Moon, there would be nothing to fill in that hole at an appreciable level. Even assuming you could "flush" the hole with transported air, it would quickly escape just because the average velocity of the molecules would exceed the escape velocity for the Moon. Unless you don't want to have a pool of liquid (better frozen) gases, which being protected from the exposure to direct solar radiation will sublimate very slowly. The total mass of the moon's "atmosphere" is something like 10t, that just isn't enough mass of atmosphere to fill a hole. Instead you would need to use a cap to hold down the air. To hold down 1atm of pressure requires the equivalent of a 10m column of water on Earth. If we assume luna regolith is 3x denser than water then in the gravity of the moon, which is 1/6th that of Earth, the cap would need to be 20m thick. I just don't think you do it, although I don't have the exact math handy to prove it. On earth, if you dig a 1km deep pit and stand at the bottom of it you get 1.12 atmospheres of pressure, or a 12% increase. There is an Interplanetary Air Pressure Calculator that holds information for several planets (although not the moon - which is understandable considering the moon has virtually no atmosphere). That says that even 5km deep into the martian crust you only increase the pressure from 0.01 atmospheres to 0.02 atmospheres. The deeper you go the weaker gravity becomes as well which will start working against you. Not the answer you're looking for? Browse other questions tagged science-based moons atmosphere space-constructs or ask your own question. Could a moon or planet exist with “puddles” of breathable air in deep craters? How would I transport an atmosphere? How to blanket moon with a permanent atmosphere? Do we actually have the technology for a permanent Moon outpost? How can the Progenitors oxygenate a world?